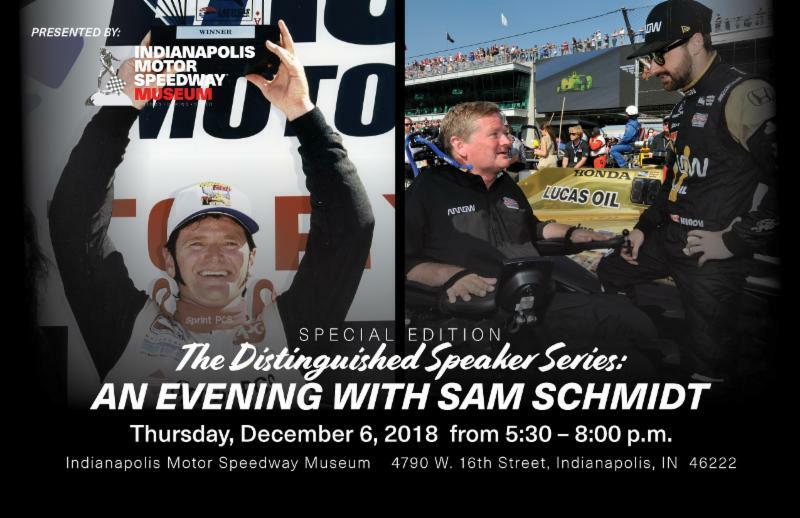 A few seats remain for a very special edition of the Indianapolis Motor Speedway Museum’s popular “Distinguished Speaker Series,” featuring IndyCar Series team owner Sam Schmidt, on Thursday, Dec. 6. The event will take place from 5:30-8 p.m. in the Museum’s atrium, featuring one of IndyCar’s most popular and compelling team owners. Bob Jenkins, the popular longtime television and radio play-by-play announcer, will serve as emcee. Tickets must be purchased in advance and are $40 for IMS Museum members and $55 for non-members, which includes hors d’oeuvres courtesy of Ruth’s Chris Steak House and a cash bar. Patrons are welcome to sign up for an IMS Museum annual membership to receive the discounted ticket price; memberships include numerous year-round benefits. To purchase tickets, contact Kelly Hartman at 317-492-6568 or khartman@brickyard.com. Schmidt, a resident of Henderson, Nev., co-owns Schmidt Peterson Motorsports (SPM) along with Canadian businessman and former driver Ric Peterson. For 2019, the team will field full-time IndyCar Series entries for James Hinchcliffe and Marcus Ericcson. Robert Wickens, who remains part of the team, drove a successful rookie campaign for SPM in 2018 until he sustained injuries in a crash at Pocono Raceway. Schmidt entered the ranks of team ownership in 2001, only 14 months after his driving career was cut short due to a crash at Walt Disney World Speedway that left him a quadriplegic. In response to his spinal injuries, Schmidt founded Conquer Paralysis Now (www.conquerparalysisnow.org), which has raised millions for spinal cord injury awareness, research and technological development. SPM is the most successful team in Indy Lights history, winning seven championships and more than 70 races. In IndyCar, SPM has scored six wins (between Hinchcliffe and Simon Pagenaud) and two Indianapolis 500 pole awards (Alex Tagliani, 2011; Hinchcliffe, 2016). Doors will open at 5:30 p.m. for the Distinguished Speakers Series with Schmidt, with food and refreshments immediately available. Schmidt’s presentation and question-and-answer session will get underway following introductions at 6 p.m.
About the IMS Museum: The Indianapolis Motor Speedway Museum is home to one of the world’s premier motorsports and automobile collections, with emphasis on the Indianapolis 500-Mile Race, the Brickyard 400 and the cultural and technological impact of IMS. Located inside the famed 2.5-mile Indianapolis Motor Speedway oval, the Museum is open 363 days a year (closed Thanksgiving and Christmas). It is a 501(c)(3) organization that relies on support from admissions, tours, sponsorships, annual memberships and planned-giving for its programming, restoration and preservation efforts and special events. For more information or to plan your visit, log onto www.indyracingmuseum.org, call the Museum at 317-492-6784 or find us on Facebook, Twitter and Instagram.